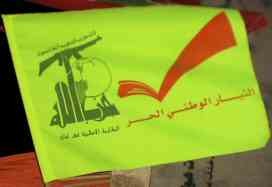 The "Free Patriotic Movement" (Al Tayyar Al Watani Al Hurr) was founded and led by Michel Naim Aoun, who was prime minister of Lebanon between 1988-1990. General Aoun main brief was to have a logo that would represent the spirit and mission of Al Tayyar Al Watani Al Horr, without using the Cedar or the colors of the Lebanese flag as they belong to the “Nation”, and many Political Parties have already used the Cedar as a symbol. The above answers allowed the creative teams to develop around 30 logos, short listed to top 5 logos by a committee of professionals. Finally, those five logos were presented to a committee of 17 People headed by General Michel Aoun, who have agreed on one logo that gather all the above criteria. And that is how the new logo has been adapted and launched. An Open book and a Road: The Open book corresponds to the ever lasting quest for knowledge, education and culture; while the Road that keeps increasing and widening (to the right edge) represents the hope and the continuous efforts for building and achieving a new and ideal Lebanon. A positive sign: This is the sign of success, proving that the FPM was right from the beginning, always positive, claiming for Justice, and working hard for a better future. The “V” sign for Victory: Always reminding of General Michel Aoun. A Bird (and a “Dove”): Representing freedom and peace, and broadening for new horizons. The Orange color: This has become the FPM color. The Orange is the sign of a new shiny day, new hope that shows that the FPM will never fade away, because it is a strong and powerful Party. The Openness: The logo open, not bound by any boundaries or limits, since most parties tend to use closed designs. Number 7 (in Arabic: V): The number 7 to remind us of the 7th of August 2001and our 15 years of struggle against the occupation of Lebanon, and the 7th of May 2005, the date of General Aoun’s a return to Lebanon. These are images of FPM political posters. The large FPM flag on the second one is a new variant, with the white checkmark superimposed over a two-tone orange gyronny. The flag of the FPM Students' Committee can be seen in a photo, even better visible here: orange flag with a large black capital Ω (omega) enclosing a green cedar, all over the white inscription لجنة الطارب (lajnat al-talab, "Students' Committee").